About 65 years ago William Thompson, a farmer who owned a wine grape vineyard in California, received a large stock of cuttings from a New York nursery company. From that stock he discovered a unique cutting which produced a grape that was unlike any ever seen in California. The grapes were light green in color, unusually sweet, possessed a delicious flavor, and contained no seeds. This green seedless grape was named after William Thompson, and has since developed an important industry for fresh grapes. Today, there are approximately 200,000 acres of Thompson Seedless grapes growing in California today. 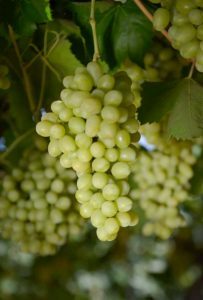 In addition to being consumed fresh, Thompson Seedless are by far the most important grape used in making raisins, and are also used to make some of the best dessert wines. Enjoy!